Discussion in 'Videocards - AMD Radeon Catalyst Drivers Section' started by Watcher, Aug 20, 2018. This tool has been mentioned here and there on different threads on Guru3D but I don't believe a thread has been started with it being the central theme. 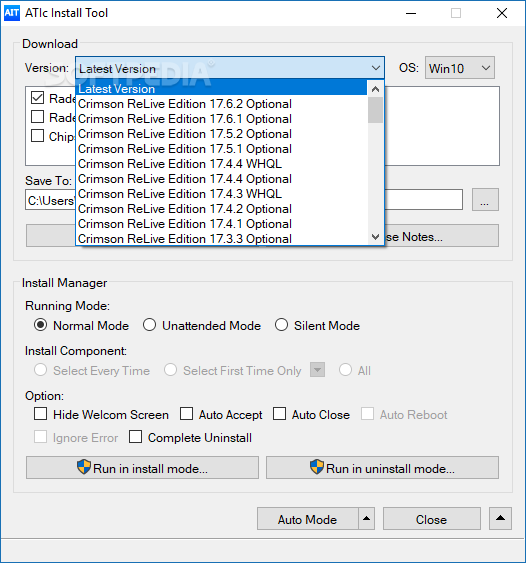 This program allows you to view the current and past Radeon drivers that are available to be downloaded from AMD including WHQL and optional versions of these drivers. From my experience, it works quite well and has been under constant development for a number of years. What it does not do is discern which Radeon driver should be downloaded for your particular hardware. Then again, no where is it stated that this program will examine your hardware and download the appropriate driver. It's easy to use. Works well. Recommended. You may want to give the program a try and see if it becomes part of your library of useful programs. ATIc Install Tool is a small software application whose purpose is to help you automatically download and install the latest drivers for AMD / ATI Radeon Series graphics card using straightforward actions. The tool sports a clean design that embeds all configuration settings in a single window. There’s no support for a help manual but the dedicated parameters are highly intuitive so you won’t spend a lot of time wondering how to tweak them. ATIc Install Tool offers you the freedom to set up the downloading process by making the application grab the latest Catalyst version or specifying the date that you are interested in. Plus, you can download AMD Catalyst Mobility graphics drivers, software suite and chipset driver as well. The tool is able to grab beta versions and lets you pick the corresponding 32- or 64-bit operating system. What’s more, you are allowed to specify the saving directory where the downloads are stored, start the download process with a single click, as well as open the release notes via your default web browser. Several dedicated functions help you gain control over the installation mode. You may opt for a normal, unattended or silent deployment type. For the unattended or silent installation type, you are allowed to select the components every time or first time only. If you enable the normal installation mode, the program gives you the freedom to hide the welcome screen, automatically accept the requirements and close the window at the end of the process, as well as enable the complete uninstallation mode. Last but not least, ATIc Install Tool allows you to activate several automatic actions, such as download, install, uninstall, reboot or close, as well as set the time until the next reboot. All things considered, ATIc Install Tool mixes up a user-friendly interface with a several handy features for helping you automate the process of updating your graphics card drivers. See these links from previous mentions about this program. Jouven, OnnA, theoneofgod and 3 others like this. That's cool tool, i like it. May be useful in some cases. I'm wondering why does it even have installer version, imo there is no need to install such tool and it is better to keep it just as a folder with .exe file but whatever people want they have it. Something what i think many would welcome would be merge of this tool with DDU, two driver tools bundled in single piece of software.